The war of 2620 left things in a pretty big mess (what? Don't you remember?). And while the major parts of the war are over, the fighting hasn't entirely stopped. With the end of war comes the dawning realization of how much needs to be rebuilt. Rebuilding takes resources. Those resources are extremely scarce. The various factions are competing for what's left. That's where you come in. 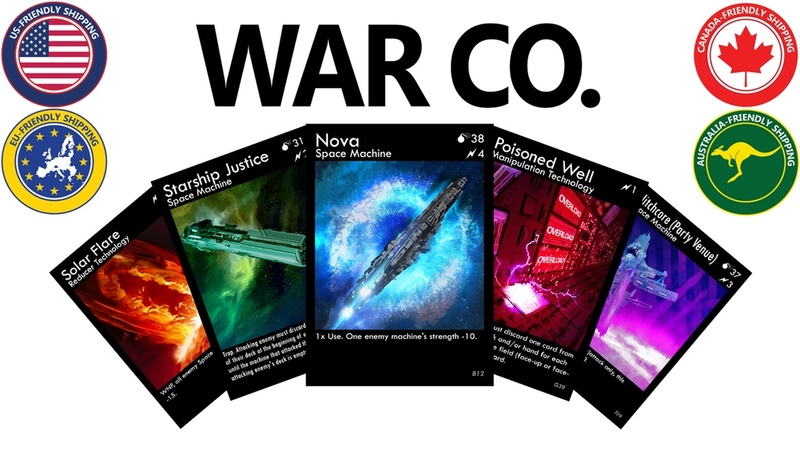 That's also the story behind War Co., a new card game that's up on Kickstarter. The goal of War Co. is to be the last one with cards still in your deck. You do this by either protecting yourself against enemy attacks, or attacking your enemies and making them discard cards (or, most likely, a combination of the two). Each player has a deck of 50 cards that they draw and play from, but also counts as their life. There are currently 6 starting decks of 50 cards apiece. You can either play with the decks as-is, or you can mix and match between them to perfect your own strategy. Combats are very simple, with no random element. Simply compare attack stats (plus any potential bonuses) and see whose is better. Or you can bait your opponent into deadly traps. Then there's various shielding equipment you can use to protect yourself and look to just outlast your opponents. The strategy is up to you. The Kickstarter campaign is up and running now. They're getting close to half-funded with still 28 days left to go.